The Marin Humane Society, Bakersfield SPCA, East Bay SPCA, Humane Society Silicon Valley, Humane Society of Ventura County, Ohlone Humane Society, Palo Alto Humane Society, Pasadena Humane Society & SPCA, Peninsula Humane Society & SPCA, Sacramento SPCA, San Francisco SPCA, Santa Cruz SPCA, Society for the Prevention of Cruelty to Animals Los Angeles (spcaLA), Sonoma Humane Society, and SPCA for Monterey County today publicly called for a boycott of the Ringling Bros. and Barnum & Bailey Circus, citing the company’s routine abuse of animals. Ringling Bros. is scheduled to perform in Anaheim, Bakersfield, Oakland, San Diego, San Jose and Stockton throughout July, August and September. California Humane Societies agree: The use of animals as circus performers is an outdated—and inhumane—concept. Behind the scenes trainers often use whips, bullhooks, electric prods and other painful tools and methods to force animals to perform tricks. When not performing, animals are kept in small, cramped cages for days at a time with little monitoring. Exotic animals that have special husbandry needs are often kept in violation. Elephants that travel with circuses spend hours in transit and in chains. Circuses train animals through such coercive means as beating, whipping, prodding and shocking. Elephants are subject to abusive handling methods from devices known as bullhooks that can puncture and tear sensitive skin. Ringling’s use of bullhooks, prods, and shackles are in violation of Federal Law. Shockingly, laws and regulations offer circus animals minimal protection, and they are rarely enforced. 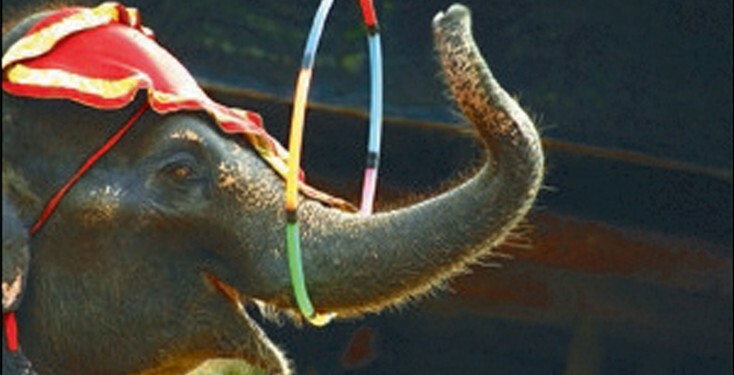 In March 2012 Ringling Brothers settled a USDA action that resulted in a fine of $270,000 for mishandling animals. This is the largest civil imposed penalty ever issued to a circus by USDA. Circuses with performing animals send the wrong message especially to children, since wild animals are living beings and are not meant to be exploited for entertainment purposes. Animals do not naturally ride bicycles, walk on their hind legs, balance on balls, or jump through flaming hoops. The circus was just in the Bay Area of NorCal recently and I couldn’t believe ANYONE in this progressive area would attend! I guess they did. I wish for the day that these institutions, with beyond little regard for animals, are considered just as barbaric as it would be today to pay to watch “freak shows” that employed people with disabilities or deformities just for a buck in entertainment.